Get out of payday loan debt, and into financial stability. Exodus Lending is a nonprofit helping Minnesota families break their cycle of payday loan debt. Payday lending’s predatory and toxic impact on our communities can be equated to a modern form of slavery. According to research, the average family in payday debt is trapped in revolving payday debt for at least 5 months out of the year. This cycle hinders individual financial well-being as well as deters them from pursuing any financial future outside of paying off debt. On average, our borrowers pay approximately 310% APR on their payday loan. According to a 2012 Pew survey, millions of Americans had payday loan debt. When a payday store opened nearby a church in South Minneapolis in 2011, the congregation took notice. They decided to take a stand with their fellow community members facing economic crisis. Exodus Financial Services, known as Exodus Lending, was founded as a first-of-its-kind nonprofit to solve the payday loan problem. 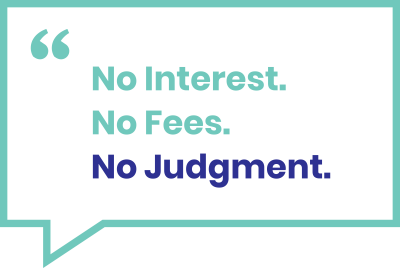 We get Minnesotans out of payday loan debt and back on track financially by enrolling and supporting them in a 0% interest refinance program, lending up to $1,000 to qualified participants. We support where you are today, and where you want to be tomorrow. The first step is getting to know you and your situation. We pay off your payday loan of up to $1,000; no interest, no fees, no strings attached. You pay us back over 12 months. We connect you with financial counseling and help you meet your savings goals. I’ve had paychecks where I wasn’t in the hole already. It’s quite enlightening. It’s giving me hope and has just lifted a great deal off of my shoulders. We are glad to pay back the loan in order to allow Exodus Lending to offer a loan to someone else who needs one. I smile a little more. I’m a little bit happier. I walk with a lighter step. I hold my head up a little higher. Everyday is a brighter day. We've helped individuals across Minnesota with their payday loans.